The olive branch, a universal symbol of peace, has become yet another source of Israeli-Palestinian conflict. 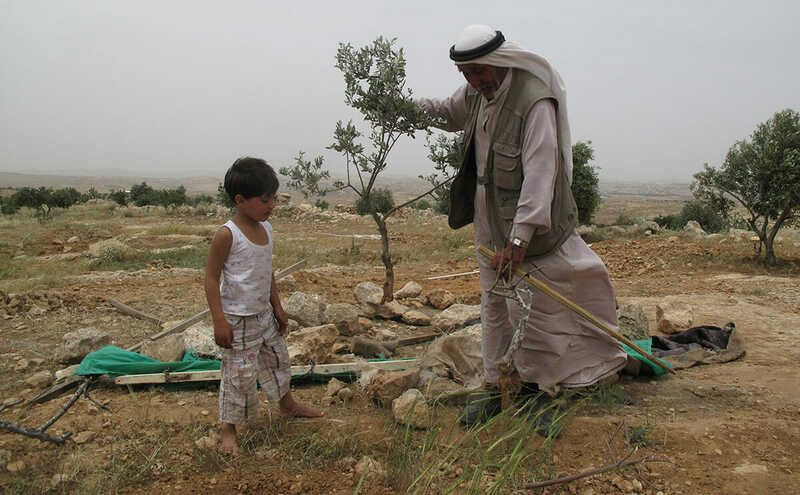 A family in the South Hebron Hills prepares to plant new trees. Courtesy Grassroots International (via Flickr). The Union of Agricultural Work Committees of Palestine (UAWC) wants to turn this dire situation around. Ali Hassouneh, the group’s board chair, believes that the olive groves represent a shared inheritance. “If I have an olive tree that is 1,500 years old, I think: Who planted it? How many thousands of people have eaten from it? The trees are our heritage ”“ my heritage and [the Israelis’], too.” The UAWC, one of the oldest Palestinian NGOs, has worked with farmers in the West Bank and Gaza on water and land access since 1986. It also provides annual support with the olive harvest. The UAWC brings hundreds of local and international volunteers to provide labor, solidarity and protection for the harvest, as they say that the presence of volunteers reduces violence. Construction on the West Bank wall began in 2002, a year in which 47 suicide bombings targeted Israeli citizens. In that context, writes Colonel Danny Tirza of the Israeli Defense Forces, the wall’s chief architect, “The security fence was an essential defensive move taken by the Israeli government in order to protect its citizens,” and indeed, suicide bombings and other attacks on Israelis have fallen dramatically since construction of the wall and concurrent developments such as a Hamas ceasefire. But in the Palestinian territories, where unemployment can run as high as 40 percent, Palestinian farmers’ olive trees are a vital source of income and food. And those aren’t the only benefits. “Agriculture is a tool of resistance, of independence … of freedom. If you have your food, even if you’re poor, you can survive,” says Hassouneh. The UAWC was built on this philosophy. Originally an informal coordinating body for agricultural workgroups in communities throughout the territories, the union formalized just before the first Palestinian intifada – or uprising – in 1987. The group began promoting self-sufficiency: distributing seeds, helping Palestinians to plant gardens and developing farmland. Hassouneh says that UAWC members – himself included – were sent to jail for these activities, but home gardens and urban agriculture helped Palestinians to survive the strict blockades and curfews of the period. More than 25 years later, although as many as 90 percent of Palestinians are economically involved in agriculture, the sector is struggling. According to a 2012 UN report, “The [Palestinian] economy has lost access to 40 percent of West Bank land, 82 percent of its ground water, and more than two thirds of its grazing land. In Gaza, half of the cultivable area … [is] inaccessible.” The UAWC has its work cut out for it. This woman works with UAWC’s women-led community groups teaching beekeeping skills. / Courtesy Grassroots International (via Flickr). The group supplies goods such as feed at cost and provides technical assistance for projects such as rainwater collection or constructing livestock shelters. The union coordinates several women’s cooperatives focused on farming, textiles and food products, where the women learn critical marketing and business skills that allow them to enter the work force. 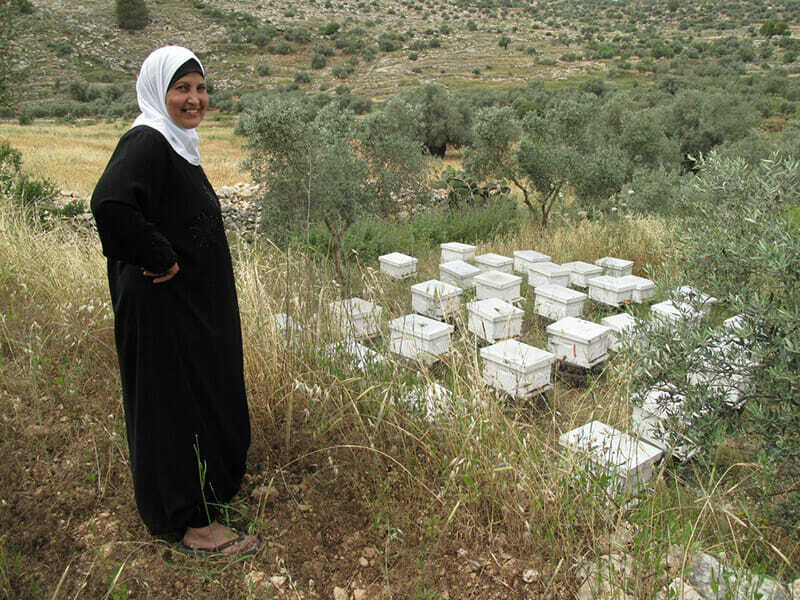 Female unemployment in the territories was almost 35 percent in 2013; projects like a successful beekeeping cooperative in the West Bank allow women to support their families and gain economic independence from their husbands. The group is continuously adapting to meet the needs of farmers. In 2003, the union learned that the very seeds on which their members depended were at risk – the local seed varieties, bred over centuries, were disappearing due to both poor weather conditions and pressure on farmers from seed companies to buy modified seeds. The UAWC began a seed improvement program and opened a seed bank in 2009. The bank, only the second of its kind in the Middle East, is actively engaged in research as well as preservation, using pollination and grafting to further improve varieties for the local environment. It provides several hundred families with seed every season, with the condition that they return a portion of their seeds to the bank after harvest. The UN recognized the seed bank this year with the Equator Prize for local sustainable development, and the UAWC was awarded the Food Sovereignty Prize last month. Food sovereignty is not just about having enough to eat, but also about having control over food and farming policies and practices. It’s not just about survival, but also self-determination.